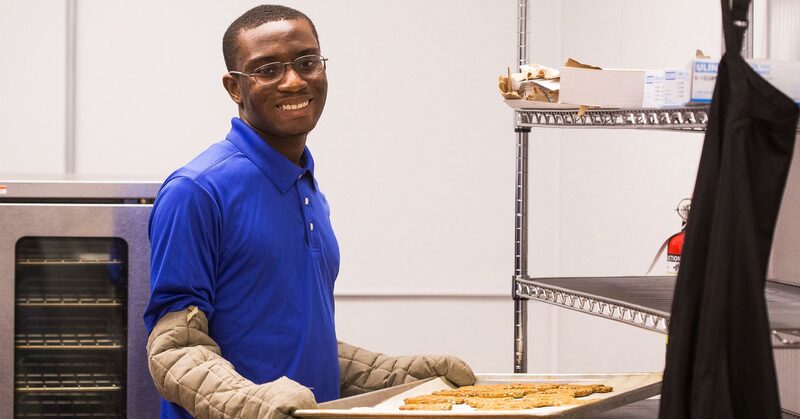 The Ädelbrook Transitional Academy is a community-based vocational program for young adults with intellectual and/or developmental disabilities. In addition to vocational training, the Transitional Academy provides functional academics, and community engagement opportunities to help prepare students for independent living. Students have the opportunity to develop critical life skills through a hands-on and exploratory curriculum. We have two Transitional Academies to ensure that the needs of all students are individualized. Transitional Academy I fosters independence by helping students manage a job as well as other necessary life skills. Students are placed in competitive employment, and are taught skills that will enhance their future vocational opportunities, such as time management, work place behavioral expectations, and use of public transportation. Transitional Academy II is for students who require intensive, one-to-one job coaching and individualized programming. In order to help prepare students for less restrictive care, the facility is equipped with a full kitchen, living/dining room, laundry facilities and shower area to maximize their functional potential with activities of daily living. Each week students participate in a Community Resource Day. This includes volunteering or learning how to access public facilities such as libraries, public parks, and community events for leisure activities. Students practice budgeting in order to have fiscal management skills. The Transitional Academies are located in the Riverview Center in downtown Middletown. This convenient location gives us easy access to many workplace partners in the community, which provide valuable opportunities for students to learn life skills and practice problem solving. Job sites are evaluated by the staff to determine the cognitive, sensory, motor, and social demands that will be placed on students to identify the most appropriate job placements. Students work 5-15 hours a week, depending on each young person’s level of functioning. In addition, we operate the Ädelbrook Bark-ery, an educational retail store specializing in homemade dog treats. Our students follow recipes to make the treats from scratch, and do the baking, packaging, and sales. This commercial outlet gives our young people experience with many more details of running a business than they would otherwise have access to.